John Frederick Nicholson was born in Portsea Island, Portsmouth in early 1893. His father Edward George was a shoe maker and his mother was Fanny. Both his parents had been born in Sussex before moving to the Portsmouth area. John and Fanny had 18 children, but only four of them lived to become adults with John being the youngest to survive. Edward and Fanny married in Sidlesham, West Sussex in 1870. They were still living there the following year, at the time of the census. By 1881 the family had moved to Portsmouth; the oldest of their surviving children Albert had been born there in 1877. Another son, Arthur aged two, was also living in the home, but sadly died the following year. In 1891, the family had expanded to include 8 year old Sidney, Thomas aged 3 and Ellen 10 months. Ellen must have died very shortly after the census as she was less that one year old. Thomas died the following year. In 1901 the family was still in Portsmouth and had been joined by 9 year old Mabel and John aged 8. These two, with Albert and Sidney, were the only four survivors of what would have been a very large family, all 18 children had been born alive but it has to be presumed that the remaining 11, that were not included in the census died at a very young age. By 1911 the family had moved to Dorking, where they lived at Hampstead Road. The two older boys Albert and Sydney had not moved with their parents. Albert was working in the docks at Portsmouth. He had married, but by 1911 was a widower. His son Albert James was living in Dorking with his grandparents, whilst Albert was lodging with his wife’s family. By 1901, Sidney had joined the navy and was a Stoker on HMS St George, but he had left the Navy by 1911 and was living close to his parents at Holmsdale Road in Holmwood with his wife Ellen (nee Francis) who he had married the previous year at St Pauls Church Dorking. He was working as a station engineman. In 1913 Mabel Nicholson married Wallace Rogerson, a piano tuner, at St Pauls Church, Dorking, it was the same year that her father died. 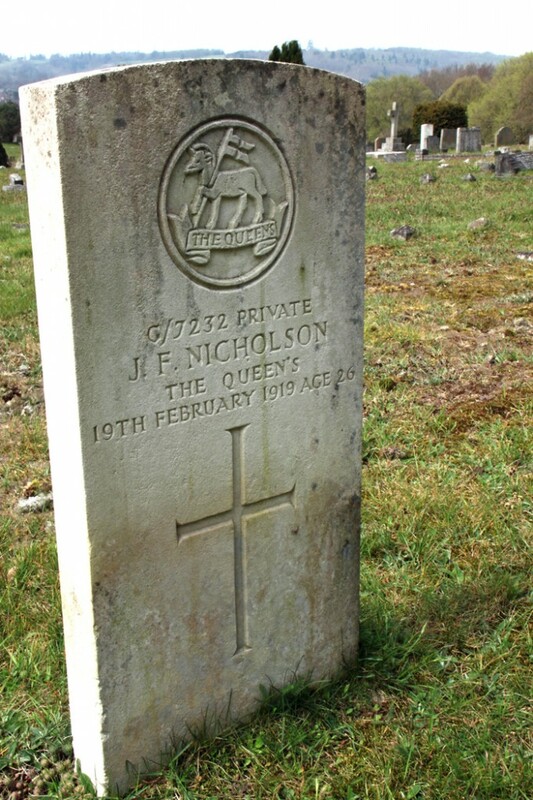 John Nicholson is one of the 61 servicemen buried at Dorking Cemetery.